I’ve read a lot of posts on The Fountain Pen Network and His Nibs’ blog bemoaning the demise of cursive handwriting, and the state of penmanship in general (especially among the younger crowd). Apparently the teaching of cursive is being scaled back or eliminated in U.S. schools (I’m not sure what’s happening here in Canada). I’m a connoisseur of fine fountain pens (fine fountain pens, not expensive ones with a white snowflake on the cap), and I enjoy writing with them (otherwise why bother collecting them). Even at work, I use a fountain pen to keep a record of what I do in a notebook. So, you’d think that I too would be alarmed by the demise of cursive. Well, you’d be wrong. “Good riddance”, I say. 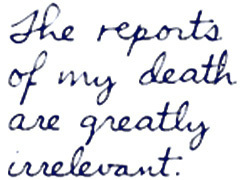 First, I don’t think the demise of cursive is related to the general state of penmanship. Rather, I think that the increasing use of computers (via the keyboard) is the main culprit there. Furthermore, I sometimes think that in the not-so-young generation (i.e., mine), cursive is part of the cause of bad penmanship. When I first started learning to write, it was with a pencil, and the form of writing was called “manuscript” or “block printing”. All letters were made up of straight lines and circles, and we were taught to lift the pencil off the page between each part of each letter. Block printing corresponds most closely to the text one sees in a book or reads on a computer screen, although there are some differences (most notably the letters “a” and “g” in many fonts). Manuscript printing as I was taught. This example is actually of the "Coming Soon" font by Open Window, from Google Fonts. The new letter forms often don’t even remotely resemble the handwritten manuscript form, or the form we see in books. The new forms have so many extra swoops and curls that they take longer to write, even when you factor in the time saved by not lifting the pen. The form of cursive that I was taught (letters shown separated for clarity). From "The Palmer Method of Business Writing", 1901. In short, traditional cursive, even when written beautifully, contributes neither to speed nor legibility. Yes, it is almost as legible as block printing once you’re used to it, but only if it’s the same form you were taught. My mother has beautiful cursive writing, but I can barely read it; she was taught in Germany, where they use different cursive letter forms than we are taught in North America. A sample of my normal handwriting when I'm not rushed. I recently discovered Italic handwriting. Note that this is not the same thing as calligraphy, unless done exceptionally beautifully and slowly. It is an everyday handwriting used by many since the Renaissance, before cursive as we know it was invented. Like block printing, Italic printing is made up of simple shapes, in this case, ovals and straight strokes. It is usually written at a slight angle, but the principles can be applied upright as well. 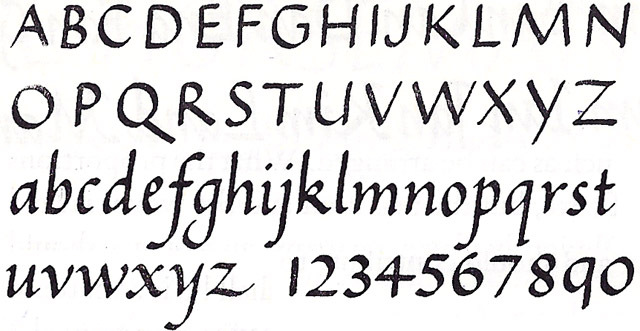 A sample of Italic printing, taken from Alfred Fairbank's book, "A Handwriting Manual". Italic is as easy to teach as manuscript, since the basic principles are equally simple, and the motions are more rhythmic and natural. Italic printing also looks much like manuscript, and is very similar to the italic characters encountered in books and on web pages. Cursive Italic handwriting, from "A Handwriting Manual". Write the letters the same as you would for Italic printing. Join them up when it is convenient and unambiguous. In other words, people who are taught Italic printing will discover Italic cursive on their own, as the need for speed takes over. The advantage over this happening to manuscript is that the Italic letters naturally lend themselves to this, and the result will still be legible. There is in fact a Society for Italic Handwriting at http://www.italic-handwriting.org … and at my own web-site HandwritingThatWorks.com I’ve quite a few other resources for Italic handwriting. Very well thought out. In my circumstance, not that I could ever claim legible handwriting, my career demanded “set-square-printing” as the standard lettering method. So my rushed writing, such as it is, is a very difficult to read hodge podge of block letters mushed together with joining on a very haphazard as-needed basis. My colleagues, clients, and friends are very glad that I can hunt and peck and all dread receiving anything handwritten from me. I don’t blame them. But if you think about it Jon, the italic capitals shown in the post are very much like the draughtsman’s printing that you’re referring to. It’s not much of a stretch to develop a draughtsman’s lowercase from that, and then join it up. I think it only matters if you want others to perceive you as well educated. Hence, my children know “which fork to use” and how to write in cursive. I love italic handwriting and having been practicing it for some months now. I toyed with the Vimala script, but realized I hated how it looked and am now either doing straight italic from a script given with a rotring pen or from the Barchowsky workbook. Cursive irritates me. Too loopy. Amberlea, I don’t think you need to write in classic Palmer cursive to appear well educated. You only need to write neatly (and of course what you write should make sense and be free of spelling and grammatical errors). Amina, I’d never heard of Vimala script, so I just looked it up. I’m with you; I hate how it looks. It looks like the writing of a child that is learning traditional cursive but hasn’t quite got the hang of it yet. And Vimala seems to have something against the lowercase letter “t”. Where can I purchase ink with which to fill my fountain pen? Eleanor, does your pen use bottled ink or cartridges? Stefan, your article has given me hope that I might yet manage to reform my untidy writing style which grew to hate. I have found, as you indicated, that straddling both the block-type and cursive style as a young person led to difficulties later on. I’m going to unearth my old Rotring fountain pen (and maybe my ancient crow-quill which I love too) and begin again to reclaim a part of my writing heritage that I thought lost for good. Thank you for the wonderful and inspiring article. Strictly speaking, it’s NOT “italic.” (No matter how many people call it that.) Italic is the right-leaning version of any font. This beautiful and efficient form of penmanship above is properly called “chancery cursive.” Tom Gourdie (q.v.) is probably its most sensible and practical proponent. No, “oblique” is the right-leaning version of any font. “Italic” is a word that is often used interchangeably, albeit incorrectly, with “oblique”. However, if you look at, for example, Times Roman in Word, the italic version is _not_ simply a right-leaning version of the regular version. The characters actually have different forms. Chancery cursive is a much more ornate writing style than regular italic. As a cheap implement to use for large italic, I recommend a carefully sharpened carpenter’s pencil. Good for greetings and notices. Hello, Our five boys all have learned, or ar learning, cursive. We see the value in the simple elegance of being able to write legibly and each boy has their own default mode: print (manuscript) or cursive.